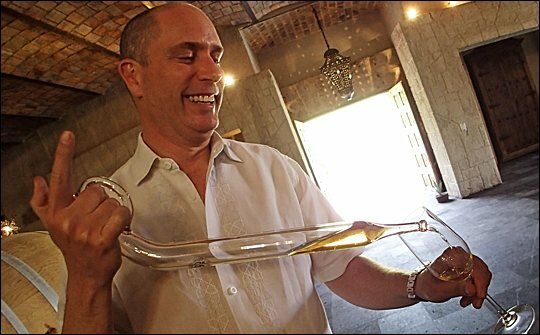 Pepe Hermosillo's entry to the business marked the seventh generation of tequila makers, though he insisted his would be something different, “a modern representation of Mexico”. His training: “Totally on the job, hands on.” He was 19 when his father died, leading him to supervise the family’s construction company until taking it public and freeing him to focus solely on tequila. Today Casa Noble produces 60,000 six bottle cases of tequila annually, a number Hermosillo would like to maximize at150,000. The distillery’s line, which includes silver, joven, reposado, añejo and extra añejo expressions, is also represented by rock guitar legend Carlos Santana, who became a partner two years ago. We caught up with Hermosillo during a March visit to his distillery in Tequila, Jalisco, Mexico. The Drinks Report: Seven generations of tequila making is quite a history. Pepe Hermosillo: The earliest written accounts of my family—actually the Gonzales-Hermosillo family—being involved in tequila was in the late 1700s. We go way back. They were producing just 22 barrels a month. That’s pretty small, of course, but even at 60,000 cases a year, we’re still quite small. For comparison, Patron is the largest in our segment, producing about 1.8 million cases a year. But we’re growing: 27 percent (in 2012), and we’re planning to grow around 24 percent this year. Some people say we’re going to be the next Patron, but that’s not our objective at all. I think 100,000 to 150,000 would be a nice level to achieve and still maintain a hand-crafted quality. To grow to 1 million cases—the effort is spectacular. TDR: Why the commitment to a fully organic product? PH: It’s been something we’ve always been committed to. In Mexico, we don’t take enough responsibility for contaminating the earth. The liquid left after distillation has a very high pH, so it needs to be treated. So once we harvest our agave, we let the fields rest for a year. We then put compost made of crushed agave from the distillery on it, and then we replant. You can’t taste organic. It’s more about the earth and our responsibility for it. Our focus is on renovating the earth, giving back to it. It’s the right thing to do. TDR: But you can taste terroir? PH: Yes. Definitely. When you have a terroir like we do, that’s stressing the plant, that fiber is going to generate a lot of other aromas when it’s cooked, such as spices, a lot of peppermint, white pepper, a lot of herbals, cut fresh grass. If you harvest agave from a place where the plant’s maturity is quicker, you’ll get a lot of fruit notes, flower notes, nuts. TDR: Talk about your decision to use new French oak barrels rather than American bourbon barrels. PH: We used to use Jack Daniel’s barrels, but in my opinion, they overpowered the tequila. We used some wine barrels, which was kind of nice, but just OK. And we tried some Eastern European barrels, which to me put some bitterness in there. So when we went with new French oak to achieve that modern representation of the spirit: different, but balanced, something that didn’t pick up too much of the barrel’s qualities but matured nicely. It’s not inexpensive to do French oak. It costs US$1,300 to US$1,400 per barrel, but they’re really well built, given a very light toast and saturated with the right water. We have a great cooperage. TDR: When that drives up costs you have to pass on to customers, is there a chance of out-pricing the market? PH: Not right now, anyway. There is very good demand. We’re in the position we want to be. TDR: You always seem busy developing new products. What’s new in the distillery? PH: One is an ultra-premium single barrel of limited availability: it’s from a unique cognac barrel in which we have aged the tequila six years. The other is the Casa Noble Joven (developed with a US distributor). It’s distilled and rested six weeks at a barrel proof of 102. We are working on making it for mixologists to have a tequila that will stand up in their cocktails. Also, we’re working on a package with Carlos Santana's new album, which is coming out next year. He is playing with a wonderful variety of artists, which I think will help us identify Casa Noble with a larger audience. TDR: What’s Casa Noble’s position in Europe currently? PH: Casa Noble has had distribution in Europe for a while now, our main hub being Germany, and then distributed to most countries, including the UK. Right now we are working on a project of opening a warehouse for distribution in Holland, just like we have in Singapore for the Asia-Pacific region and Miami for Caribbean, Central and South America. This is for a faster and better service to our distributors. We are also in talks with a new importer in the UK with aggressive plans for the brand. The UK is one of the most important places to have brand recognition in the world. TDR: What products of yours do Europeans most prefer? PH: I believe that in Europe Casa Noble is recognized as a premium brand, but although it’s used for cocktails by great mixologists, it is appreciated by connoisseurs as a spirit in itself. That separates us from most tequilas sold in the region that tend to be more commercial. Steve Coomes is a US-based freelance journalist who writes about retaurants, food, drink and travel. He visited Casa Noble on behalf of The Drinks Report.